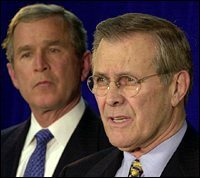 BOGOTA, Colombia, Aug. 19 - Secretary of Defense Donald H. Rumsfeld announced today that President Bush has approved the resumption of an American-supported program in which Colombian fighter pilots can force or shoot down airplanes suspected of ferrying drugs. The program, called Airbridge Denial and a key component in Washington's war on drugs in South America since 1995, was suspended here and in Peru after a Peruvian fighter shot down a private plane in 2001 that was carrying American missionaries. Now, after more than two years of preparations to install safeguards to prevent another mistaken downing, the United States and Colombia will work together to identify drug planes and force them down, American officials said. A much more limited program will be implemented in Peru, officials said, but that is still months away. Mr. Rumsfeld, traveling with reporters on a one-day trip to Colombia, said, ``There are plenty of ways that illegal trade can move - land, sea or air - and if you're not attentive to the air, it becomes a preferred method'' of the traffickers. Mr. Rumsfeld arrived in BogotÀa this morning under tight security to discuss with Colombian officials the future of American aid for Colombia's government, which is fighting three armed insurgencies and the robust cocaine industry that helps fund them. Colombia has already received $2.5 billion in mostly military aid in the last three years, making it the third largest recipient of American foreign aid. Under the drug interception program, American and Colombian radar coordinates that identify suspected drug flights would be passed along to Colombian crews flying Cessna Citation surveillance aircraft. The surveillance plane would then direct Colombian air force A-37 Dragon Fly fighters to hone in. Arinc Inc., a Maryland-based aviation company that has trained Colombian pilots and technicians, would have at least one bilingual observer, most likely an American, on each surveillance flight to maintain contact with radar operators and Colombian air force commanders. A Bush administration official who has worked on the program said any plane suspected of carrying drugs, or drug profits, could be forced down or shot down by the A-37's. The officials said the shootdown orders could only come from one man: Colombia's air force commander, Gen. Hector Fabio Velasco. American officials said there is a series of safeguards in place. After identifying a suspected drug plane, authorities would have to make radio or visual contact and try to force the pilot to land. If the pilot disobeys, then warning shots could be fired. Only as a last resort, American officials say, can a plane be shot down. The policy, though, is already being harshly criticized by Human Rights groups and some American congressmen who say it violates international law. Human Rights Watch officials, who have met with American and Colombian officials to raise concerns, say the program violates American law enforcement use-of-force principles, since drug flights are not normally an imminent threat. ``To shoot civilian planes in cases that are not in self defense or in cases where you're not in a war, fighting combatants, is the equivalent to an extra-judicial execution, regardless of the cargo,'' said Jose Miguel Vivanco, director of the Americas division of Human Rights Watch. Mr. Vivanco also criticized the role General Velasco will play. Some American officials have been prodding Colombian President Alvaro Uribe to fire Mr. Velasco because of the air force's role in the 1998 bombing of the village of Santo Domingo, in which 18 civilians were killed. Washington has already banned aid to the air force unit responsible for the bombing, arguing that it stalled an investigation into the attack. American officials say the policy cuts out the short cuts and improvisation that a State Department report found had contributed to the accidental shoot down in Peru. The air interdiction program began in Peru in 1995 and quickly had a crucial effect in the drug war in the Andes, where most of the world's cocaine is produced. Drug traffickers had long been using small private planes to ferry coca paste, the main ingredient for cocaine, from Peru to the Colombian jungle labs that manufacture cocaine. About 40 planes were shot or forced down and others were seized on the ground, leading traffickers to increasingly shift to ground or river transportation. But on April 20, 2001, a Peruvian intercepter jet shot down a plane carrying a group of American missionaries. Veronica Bowers and her baby daughter, Charity, were killed. Her husband, James, and their son, Cory, survived. The pilot, Kevin Donaldson, though wounded, managed to crash land the plane. The shootdown raised serious questions about the safeguards in place to prevent accidental downings and deeply concerned American officials about future lawsuits, said officials familiar with the policy. Mr. Vivanco, though, said the fear of lawsuits has led American officials to shift more of the responsibility to Colombia. Indeed, the American official stressed that the Colombian government, not the United States, would oversee the program.